Sandpiper Condominiums are currently closed due to damages caused by Hurricane Harvey. We are working through the rebuild process, but do not have a completion date at this time. Sandpiper Condominiums is proud to announce that all units are now equipped with Time Warner's Tubro High Speed Internet Service. The Sandpiper is the premier condo property on Mustang Island, which, in turn, has been identified as one of the 10 best barrier islands resort areas in the United States. You’ll experience a sense of comfortable elegance while sitting on your private beachfront balcony enjoying the panoramic views of the Gulf of Mexico and the Mustang Island coastline. Relax in the Sandpiper heated outdoor pool and hot tub or stay fit in our exercise room or on our private tennis courts. Enjoy exercise with the children in our covered game room offering shuffleboard and table tennis or spend time playing games with the children in the comfortable elegance of our spacious lobby. Simply relax and enjoy reading with your family in our lobby library while enjoying the sights and sounds of the ocean’s waves and catching glimpses of the abundant wildlife inhabiting our private beach. Whether you plan on engaging in an array of water sports or simply lounging on the beach sipping a refreshing cocktail, the Sandpiper offers you a beach getaway with an added touch of luxury and style. The quaint coastal city of Port Aransas, Texas is just a few minutes away offering excellent dining, entertainment and shopping experiences; with downtown Corpus Christi a quick 20 minute trip. All units in our premier resort overlook the beautiful Gulf of Mexico and whether your choice is a one, two, or three bedroom unit, they are furnished with a fully equipped kitchen, have daily maid service, on site laundry facilities , and a 24/7 front desk service to ensure your stay is first class. The Sandpiper is a luxurious, conveniently located Condominium just seven short miles from the quaint fishing village of Port Aransas, Texas, with its fine shopping and restaurants. Located on Mustang Island beachfront, we are convenient to Corpus Christi, Texas, with its visitor attractions such as the Texas State Aquarium and the Lexington. Come experience the Sandpiper! NOW with free high speed internet in each room and in pool and lobby areas! Summer Rates - May 26th to September 4th 2017 **Prices do not reflect 15% state and local occupancy tax. Spring / Fall Rates - March 1st to May 25th & September 5th to October 31st **Prices do not reflect 15% state and local occupancy tax. Winter Rates - November 1st to February 28th **Prices do not reflect 15% state and local occupancy tax. Two-night minimum stay is required of all reservations made in advance, three-night minimum on holidays. Sandpiper Condominiums strives to provide all of its guests with a unique tropical vacation experience. 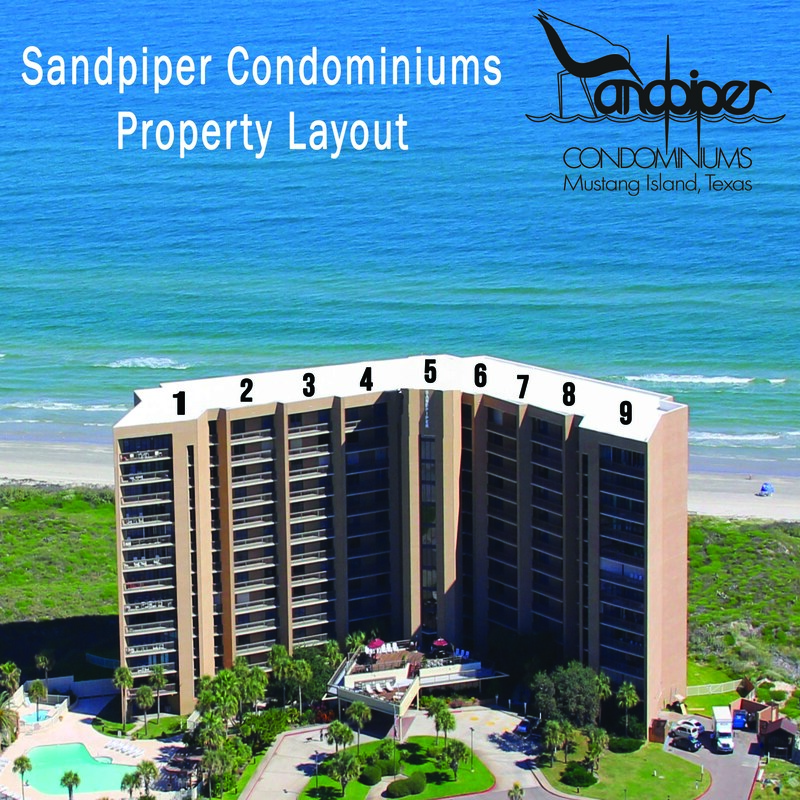 While Sandpiper Condominiums will make every effort to keep you in your chosen unit, we regretfully cannot guarantee a specific condo as all units are individually owned and some circumstances may arise outside of Sandpiper's control. Deposits: An advance deposit of the first night stay is required on all reservations. Deposits will be accepted in the form of a credit card, check or money order to secure reservations. If sending a check or money order, failure to send the deposit within seven days of the date the reservation is made may result in cancellation. Deposits for Long Term Guests: a $300 deposit is required for all guests staying 30 days of longer. Cancellation / Changes to Itinerary: Notice of cancellation must be given at least 72 hours prior to arrival to be eligible for a refund, minus a $25.00 cancellation fee. Once within 72 hours any changes to the itinerary will not be eligible for a refund. For long term stays, at least 30 days notice must be given to be eligible for a refund, minus the $25.00 cancellation fee.